Many people like Korean side dishes. They are light, refreshing, and delicious. 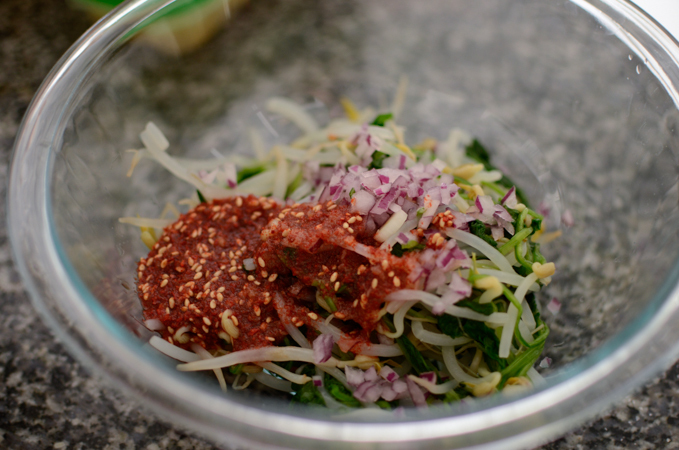 Here is a great Korean side dish/salad that you can make with spinach and mung bean sprouts combined. Some of the side dishes are easy to make, but some other dishes takes time and effort to create at home. You can be creative and make your own kind with trying with things you can find. I don’t think you will see this spinach/mung bean sprouts combination dish at Korean restaurants that easily. They are great together. Beautiful color contrast with soft and crisp textures. 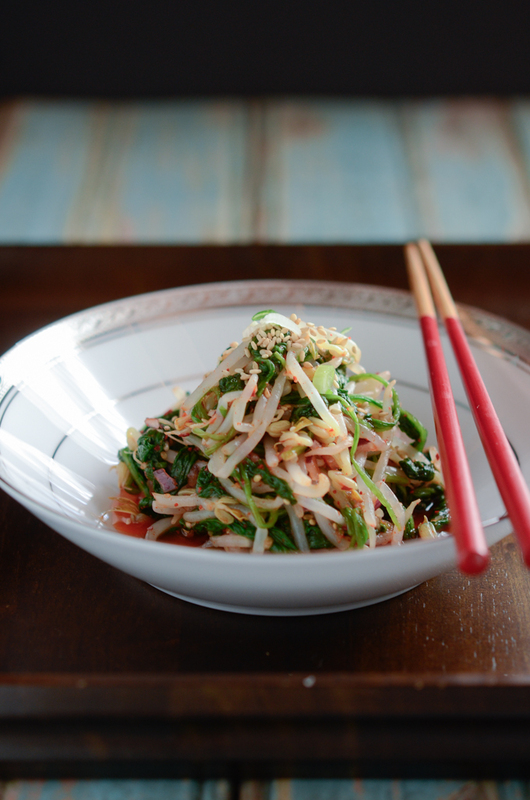 This Korean spinach mung bean sprouts salad is refreshingly light and delicious. It is very quick to make, too. Blanch spinach and mung bean sprouts in boiling water with salt for 10 seconds. Drain them out and rinse under cold water several times. Squeeze out gently to remove excess water and place in a mixing bowl. Make a dressing by combining Korean soy sauce for soup, rice vinegar, Korean chili flakes, minced garlic, sesame seeds, sugar, and Korean green plum syrup (mashil-jeup, 매실즙). This is the Korean green plum Syrup. It is my homemade syrup that I use very often in variety of Korean dishes. 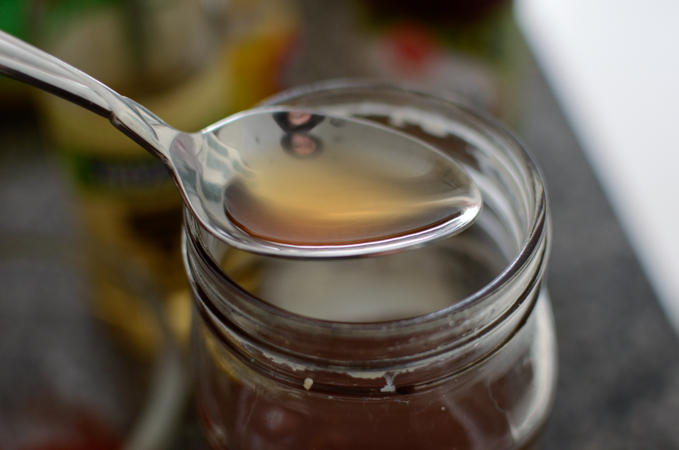 You will find how to make this syrup in my post with this link. It brings an extra something to the dish. You don’t need to add it, if you don’t have it or can’t find it at the store. The salad will still taste great. Combine the spinach/mung bean sprouts, minced red onion (or green onion), and the dressing. Toss well with a hand incorporating the dressing with every strands of spinach and bean sprouts with a very gentle massaging motion. The mixing technique is called muchim (무침) in Korea. We use a hand to toss vegetables with sauce. 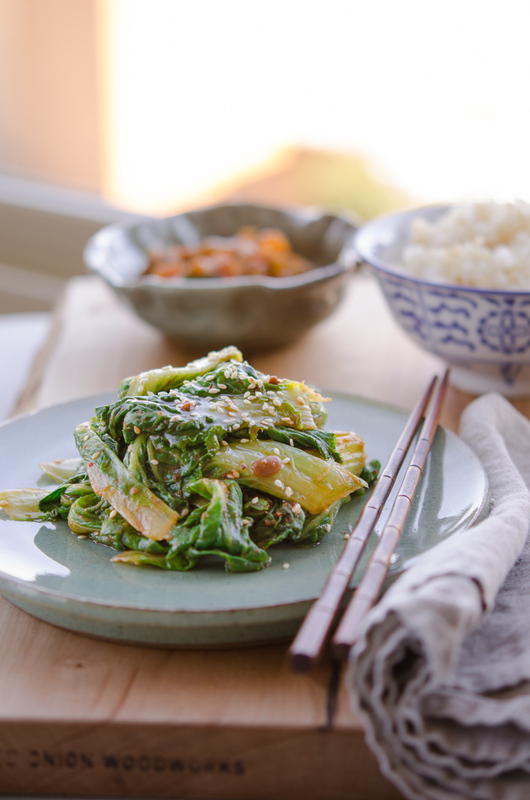 Many Korean vegetable side dishes are made this way. That’s all the cooking. Very quick, right? You will like the refreshing flavor of this salad. It is very mildly spicy so even young kids can handle it. You can use less chili flakes if you wish. 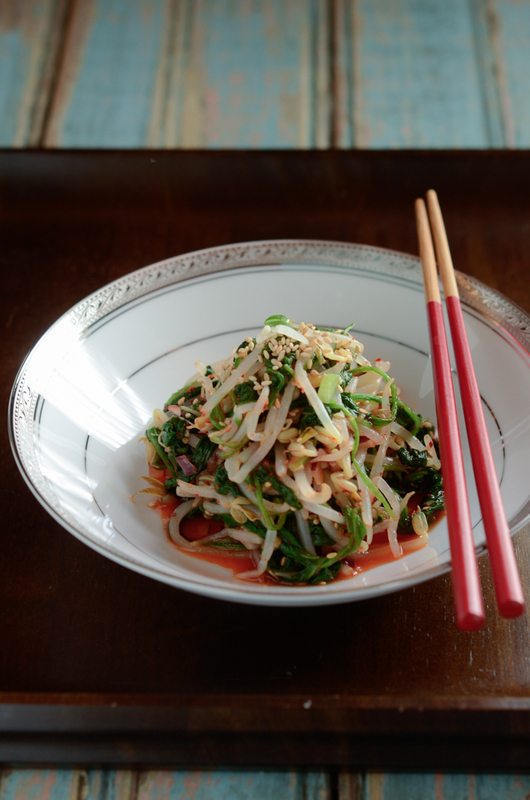 Simple and refreshingly tasty Korean spinach mung bean sprouts salad with a very mild chili sauce. Bring a pot of water to boil. Add some salt and blanch spinach and mung bean sprouts fr 10 seconds. Drain and rinse under cold water several times. Squeeze out gently to remove the extra moisture. 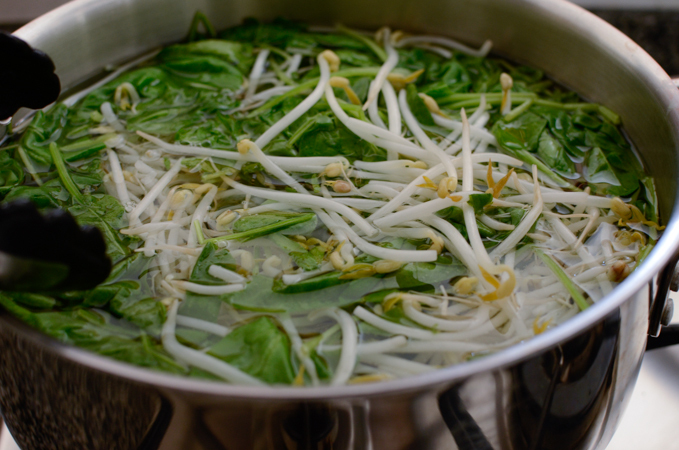 Place the spinach and bean sprouts in a mixing bowl and set aside. 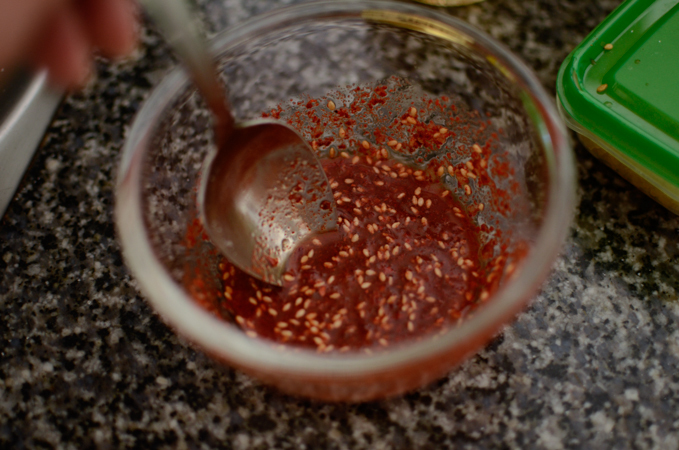 For the dressing, combine Korean chili flakes, garlic, Korean soy sauce for soup, vinegar, green plum syrup, sugar, sesame oil, and sesame seeds in a small bowl. Mix well. Adjust the amount of sugar for your preference. 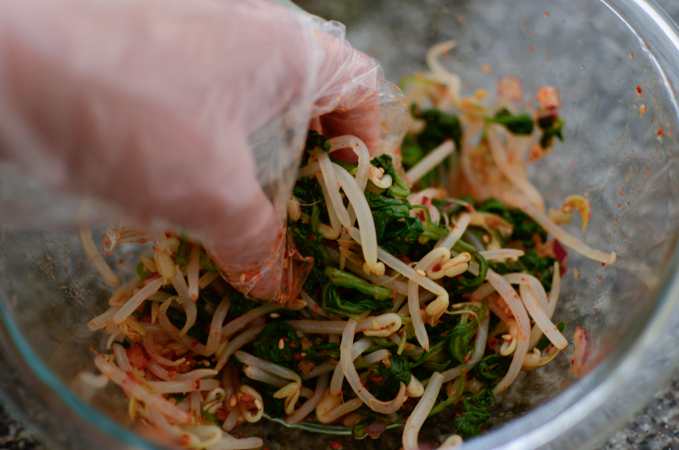 Add the dressing into the spinach/mung bean sprouts in a mixing bowl. add finely chopped red onion (or green onion) and toss everything with a hand to incorporate the flavor. Season with salt and pepper if needed. Serve at room temperature or chilled. If chilled, serve within 2 hours. Wow, such much flavor! 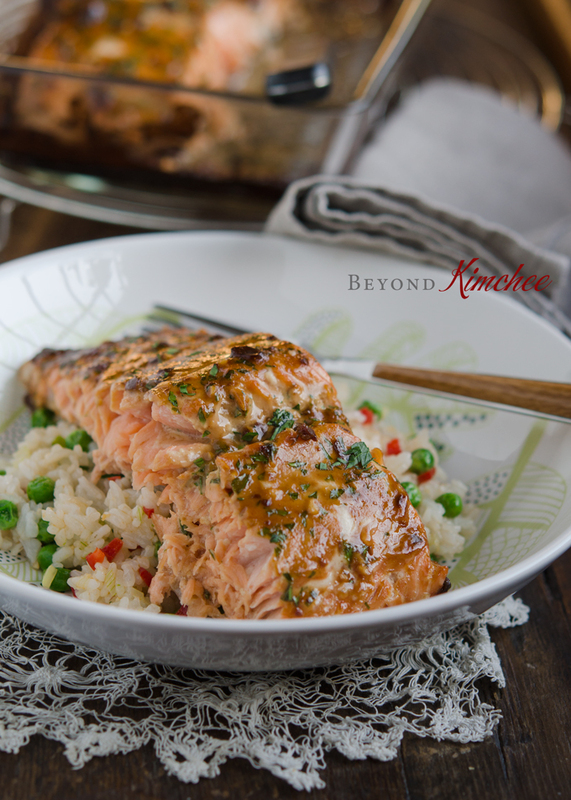 Really fun combo of ingredients -- love all the textures. This looks so interesting -- thanks! Thanks, John. It indeed has a nice combination of both flavor and texture. Hi Holly, I'm going to give this try cuz it looks good. Do you only use the leafy parts of the spinach? What about the long stem? Sorry if this sounds stupid, I'm a new cook. Use the whole spinach both stem and leafy parts. It is really light and tasty salad to serve as a side dish. Hope you like it. There is a printable recipe on the bottom of the post. This does sound so delicious! I wish I could try the green plum syrup, it sounds like such an interesting flavor! 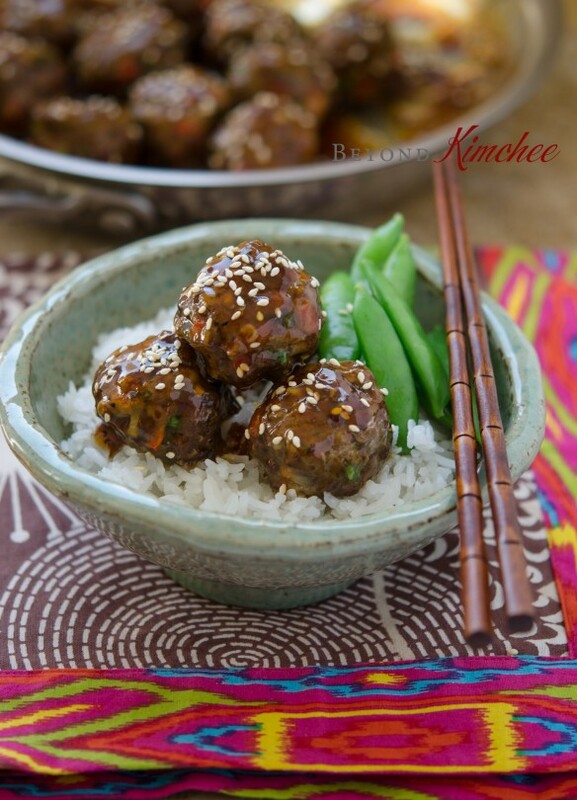 I love kimchi, this looks yummy and easy!